Being a vast region, the Texas area has had its share of good and bad experiences with the numerous Native Indians. Warlike tribes made life difficult and dangerous for Europeans through their attacks yet the friendly tribes taught newcomers how to grow indigenous crops, prepare foods, and hunt game. Numerous Spanish explorers came first to the Gulf Coast in the early 1500s. In 1690 Spanish government was worried that France posed competitive threat. So the Spanish started constructing several missions in what would be Eastern Texas. The Spanish missionaries were threaten and forced out by the Indians. The French started in 1710s started settlements in Eastern Texas area followed by new Spanish missions built in 1716. San Antonio became the first permanent Spanish mission by 1718. Over those years it proved hard to encourage colonies to the Texas region, mostly due to the hostile Indians. Some of the tribes included Comanche, Hasinai and Tonkawa. By 1803 with the Louisiana Purchase many American settlers eager for land poured into Texas. By 1821, the Texas area was part of Mexico. To encourage further development, Mexico granted large tracts of land to settlers from the United States, Europe, and the Mexican interior. By 1825, Texas had a population of approximately 3,500, with most of Mexican descent. In examining Texas genealogy, it is shown there was a quick influx of Americans. By 1834, Texas had grown to approximately 37,800 people, with only 7,800 of Mexican descent. Mexico tried to discontinue the large numbers of non-Hispanics into Texas, but it was too late. The new settlers were even ready to declare Texas an independent Republic. However, between to deal with the Indians and Mexico, Texas accepted the eventual annexation into the United States. 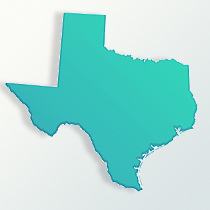 By December 1845, Texas was admitted as the 28th state to the United States. After 1850 when the borders were finally settled, huge numbers of emigrates poured into the state. Especially the eastern section became cotton farms, a rich cash crop. With the outbreak of the American Civil War, Texas joined the Confederacy in March 1861. Not all Texans favored secession initially, although many of the same would later support the Southern cause. Being on the Mexican border, Texas became a supply state to the Confederacy, with needed supplies coming across the border. The last major battle of the Civil War was in Texas in mid-May of 1865 at Palmito Ranch near Brownsville. In 1901, south of Beaumont the first oil well was located. Additional wells were located in Eastern and Western Texas as well as off the coast in the Gulf of Mexico. This massive oil boom averaged three million barrels per day at its peak in 1972. During the 20th century many Texas migrated out of the state during the Great Depression seeking better conditions. There was also the migration of African-Americans out of the state to many of the northern states. In the 1940s many people left the ranges and farms for the cities. By the 21st century two-thirds of all Texans live in a major metropolitan areas, located mostly in the eastern half of the state. The three largest European ethnic groups in Texas are Germans, Irish and English. In looking at Texas genealogy, the white non-Hispanic population is about 48 percent of the total population. Those of Hispanic origin represent 36 percent. The African-American population is about 11.5 percent. A very small percent of Texans are native Indians, only .5 percent. The state does have a large minority of those with multiracial heritage; especially of European and Hispanic. The Asian population in Texas has grown in recent years, primarily locating in Houston and Dallas. They are from Vietnam, China, Philippines Korea and Japan. With the strong Hispanic population those practicing the Roman Catholic faith represent 28 percent of the state people. The eastern portion of Texas is part of the southern ‘Bible Belt’ with many of it citizens following the Baptist religion. Also, strong in numbers are the Methodists in Texas.